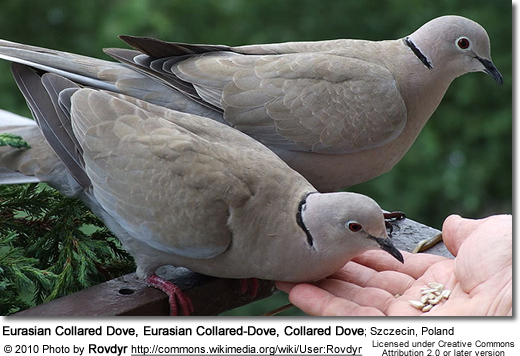 The Eurasian Collared Dove, Streptopelia decaocto, also called the Eurasian Collared-Dove or simply the Collared Dove, is one of the great colonisers of the avian world. 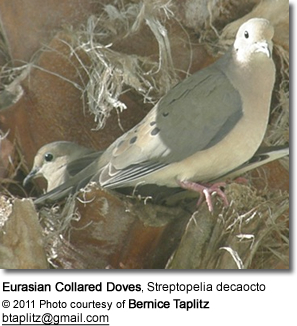 It appears to occupy an ecological niche between that of the Mourning dove and Rock pigeon; some have suggested that its spread represents exploitation of a niche made available by the extinction of the Passenger pigeon. Its original range was warmer temperate regions from southeastern Europe to Japan. However, in the twentieth century it expanded across the rest of Europe, reaching as far west as Great Britain by 1953, and Ireland soon after. It also now breeds north of the Arctic Circle in Scandinavia. It is not migratory. It was introduced into the Bahamas in the 1970s and spread to Florida by 1982. Its stronghold in North America is still the Gulf Coast, but it is now found as far south as Veracruz, as far west as California, and as far north as Alaska, the Great Lakes, and Nova Scotia. Some of the more distantly dispersed records may refer to local escapes from captivity.Its impact on native species is as of yet unknown. One Avianweb visitor, Michele Meisler, reported that this dove is abundant on Malcolm Island, a small island on the Canadian West Coast. 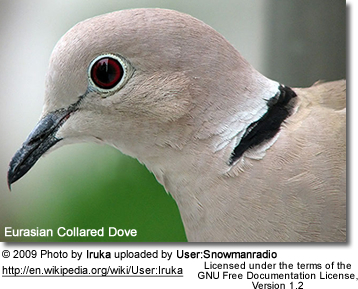 Another BeautyOfBird (Avianweb) visitor, Kathleen, wrote in that for the first time the Eurasian Collared Doves have been sighted in Ketchikan Alaska. In fact, several sightings have been made so they are assuming a "flock" of them came up this spring. 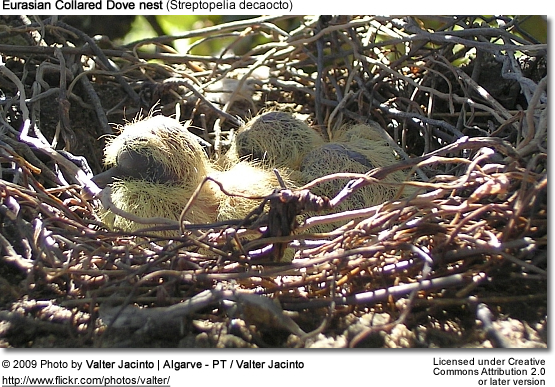 It breeds wherever there are trees for nesting, laying two white eggs in a stick nest. 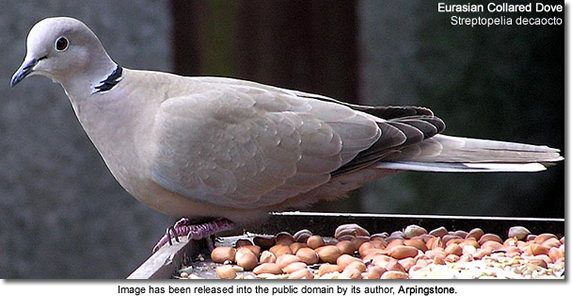 This is a small dove, buff grey with a darker back and a blue-grey wing patch. The tail feathers are tipped white. 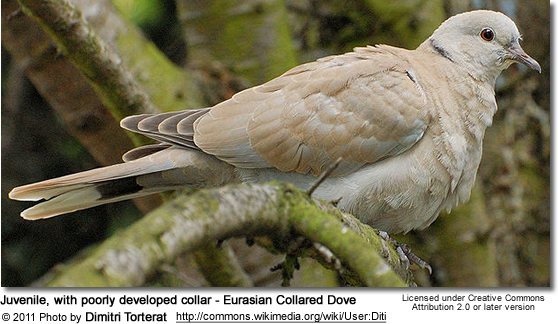 It has a black half-collar on its nape from which it gets its name. The short legs are red and the bill is black. The eye is reddish/brown. 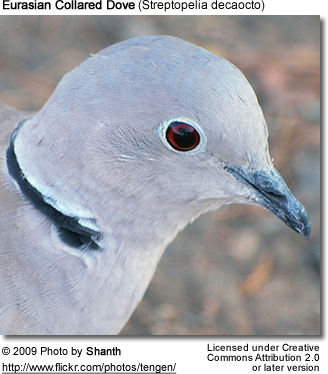 From a distance the eyes appear to be black, as the pupil is relatively large and only a narrow rim of reddish-brown eye color can be seen around the black pupil (click on photo to see features in detail). This is a gregarious species, and sizable winter flocks will form where there are food supplies such as grain. It is not wary and often feeds very close to human habitation, including visiting bird tables; the largest populations are typically found around farms where spilled grain is frequent around grain stores or where livestock are fed. It is a gregarious species, and sizable winter flocks will form where there are food supplies such as grain which is its main food as well as seeds, shoots and insects. The song is a coo-COO-coo, repeated many times. 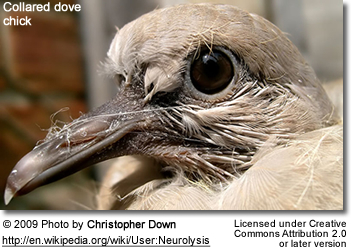 It is phonetically similar to the Greek, decaocto ('eighteen'), to which the bird owes its name. It also makes a harsh loud screeching call lasting about two seconds, particularly in flight just before landing. A rough way to describe the screeching sound is hah-hah. 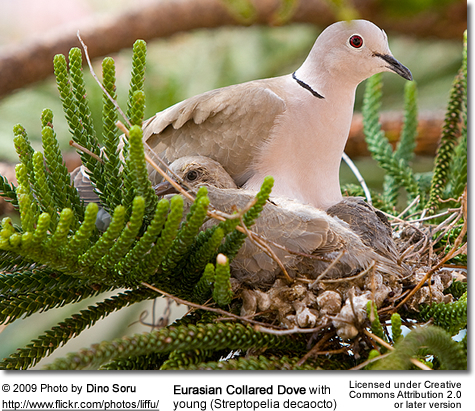 Collared Doves cooing in early spring are sometimes mistakenly reported as the calls of early-arriving Cuckoos, this call being traditionally regarded as a sign of spring in many parts of Europe. This is a very hardy species, adaptable to weather extremes. It seems to avoid wind chills. Their life span in captivity is around 20 years. 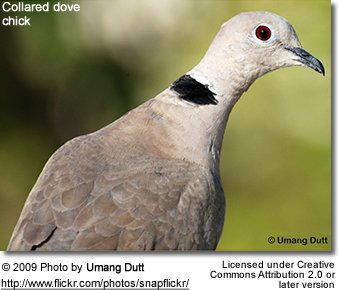 This dove is easily distinguished from the Turtle Dove by its very dark primary feathers and by its characteristic vocalization. Seeds, greens and some fresh fruit should be provided. 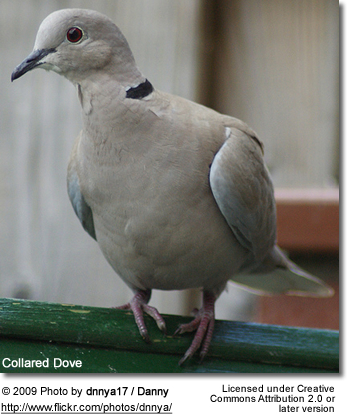 This dove prefers to forage on the ground but will use elevated food trays. Males have a showy display featuring much bowing and cooing. 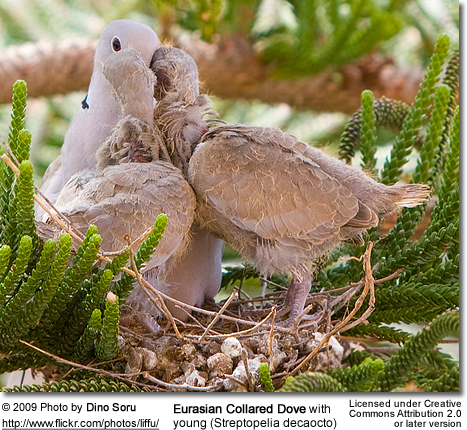 Some males can be aggressive towards other collared doves during breeding season. The average clutch consists of two white eggs, which are incubated for 14 to 18 days. The young fledge after 19 days.